For the song by Eddy Grant of the same name, see Going for Broke (album). Romancing the Stone earned over $86,572,238 worldwide in box-office receipts. It also helped launch Turner to stardom, reintroduced Douglas to the public as a capable leading man, started Zemeckis' frequent collaboration with Alan Silvestri, and gave Zemeckis his first box-office success. Decades later, it retains critical acclaim, with an 87% approval rating on Rotten Tomatoes. Joan Wilder (Kathleen Turner) is a lonely romance novelist in New York City, whom her editor believes is waiting for a romantic hero like in one of her books. One day Joan gets a call from her sister, Elaine, who has been kidnapped by antiquities smugglers, cousins Ira (Zack Norman) and Ralph (Danny DeVito). As Joan leaves her apartment to meet her editor, she is handed a letter containing a map, sent to her by late brother-in-law. Returning to her apartment, she finds it ransacked and the apartment supervisor dead. On the phone, Elaine tells Joan to go to Colombia with the map she received, it is Elaine's ransom. Flying to Colombia, Joan is detoured from the rendezvous point by Colonel Zolo (Manuel Ojeda), the man who killed Elaine's husband. He tricks her into boarding the wrong bus, heading deep into the interior of the country instead of the coastal city of Cartagena, where Elaine is being held. When Joan asks the bus driver where they are going, she causes the bus to crash. As the rest of the passengers walk away, Joan is menaced by Zolo but is saved by American exotic bird smuggler Jack T. Colton (Michael Douglas), whose Jeep is wrecked in the bus crash. For getting her out of the jungle and to a telephone, Joan promises to pay Jack $375 in traveler's cheques. Jack and Joan travel the jungle while eluding Zolo, who wants a treasure the map leads to and is chasing them with the military police. After spending a night hiding in a marijuana smuggler's crashed C-47 aircraft, they encounter a drug lord named Juan (Alfonso Arau), who is a big fan of Joan's novels and helps them escape from Zolo. After a night of dancing and passion in town, Jack suggests to Joan that they find the treasure themselves before handing over the map. They follow the clues and locate an enormous emerald called El Corazón ("The Heart"). Unknown to Jack and Joan, they had used Ralph's car for the last leg of their journey while Ralph was sleeping in the back. Ralph takes the emerald from them at gunpoint. When Zolo appears, Jack steals the jewel back, but Jack and Joan are chased into a river and go over a waterfall. They end up on opposite sides of the raging river; Joan has the map, but Jack has the emerald. Jack directs Joan to Cartagena, promising that he will meet her there. In Cartagena, Joan meets with Ira and Ralph who are still holding Elaine, but the exchange is interrupted by Zolo and his men, who have also captured Jack. Jack surrenders the emerald to Zolo, but a crocodile bites off Zolo's hand and swallows it along with the emerald. As a gun battle takes place between Zolo's soldiers and Ira's gang, Joan and Elaine dash for safety, pursued by Zolo. Jack tries to stop the crocodile from escaping but lets it go when he sees that Joan is in danger. Zolo charges at Joan, who eventually dodges his wild knife slashes, knocking Zolo into the crocodile pit. Ira and his men escape, but Ralph is left behind as the authorities arrive. After a kiss, Jack dives into the water after the crocodile, leaving Joan behind with her sister. Some time later, Joan is back in New York City, delivering a new manuscript based on her adventure. Returning home, she finds Jack waiting for her in a sailboat named the Angelina, after the heroine of Joan's novels, and wearing boots made from the crocodile's skin. He sold the emerald and bought the boat of his dreams. They go off together, planning to sail around the world. Filming locations for Romancing the Stone included Veracruz, Mexico (Fort of San Juan de Ulúa); and Huasca de Ocampo, Mexico. The scene where Turner and Douglas get separated on opposite banks on a whitewater river, about two-thirds into the movie, was filmed on the Rio Antigua near the town of Jalcomulco, Veracruz. 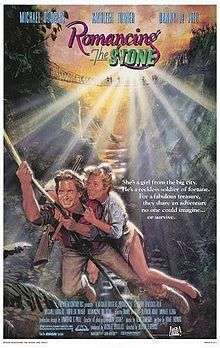 Upon the release of Romancing the Stone, comparisons to Raiders of the Lost Ark were inevitable; Time magazine called the film "a distaff Raiders rip-off". The screenplay for Romancing had actually been written five years earlier by a Malibu waitress named Diane Thomas in what would end up being her only screenplay. She died in a car crash shortly after the film's release. Turner later said of the film's production, "I remember terrible arguments [with Robert Zemeckis] doing Romancing. He's a film-school grad, fascinated by cameras and effects. I never felt that he knew what I was having to do to adjust my acting to some of his damn cameras – sometimes he puts you in ridiculous postures. I'd say, 'This is not helping me! This is not the way I like to work, thank you!'" Despite their difficulties on the film, Zemeckis would go on to work with Turner again, casting her as the voice of Jessica Rabbit in 1988's Who Framed Roger Rabbit. Studio insiders expected Romancing the Stone to flop (to the point that, after viewing a rough cut of the film, the producers of the then under development Cocoon fired Zemeckis as director of that film), but the film became a surprise hit. It became 20th Century Fox's "only big hit" of 1984. Zemeckis later stated that the success of Romancing the Stone allowed him to make Back to the Future, which was an even larger success. The novelization of Romancing the Stone was credited to Joan Wilder though it (and a novelization of the sequel movie, The Jewel of the Nile) was actually written by Catherine Lanigan. Romancing the Stone was well received by critics and is considered by some as among the best films of 1984. It holds an 87% approval rating on the review aggregation website Rotten Tomatoes, based on 43 reviews. The success of Romancing the Stone also led to a sequel that was equally successful commercially, 1985's The Jewel of the Nile, without Zemeckis at the helm but with Douglas, Turner and DeVito all returning. Another sequel, called The Crimson Eagle, never made it past the development stage. This planned yet un-produced sequel would have seen Jack Colton and his partner Joan Wilder take their two teenage children to Thailand where they would find themselves blackmailed into stealing a priceless statue. DeVito reunited Douglas, Turner, and himself in his 1989 film The War of the Roses. In 2005 and again in 2008, Michael Douglas was working on a second sequel to Romancing the Stone entitled Racing the Monsoon, although there have been no further developments in recent years. Since 2007, 20th Century Fox considered a remake of Romancing the Stone with the possibility of a "reboot" of a series. The roles of Jack Colton and Joan Wilder would be filled by Taylor Kitsch (or Gerard Butler) and Katherine Heigl. By 2011, the remake was re-worked as a television series. ↑ A virtual Who's Who of Hollywood were considered for the leads in Romancing the Stone, the list included Burt Reynolds, Clint Eastwood, Paul Newman and Christopher Reeve for the part of Jack Colton and Debra Winger as Joan Wilder. ↑ Solomon 1989, p. 260. ↑ Pollock, Dale. "Zemeckis puts his heart and soul in 'Romancing The Stone'". Los Angeles Times (Los Angeles), March 29, 1984. p. m1. ↑ "Receipts: 'Romancing the Stone'." Box Office Mojo. Retrieved: March 28, 2016. 1 2 "Romancing the Stone (1984)". Rotten Tomatoes. Retrieved July 27, 2012. ↑ Bouey, Steve. "Finally on Location." The World by Road, January 19, 2009. Retrieved: March 28, 2016. ↑ Schickel, Richard; Corliss, Richard (April 23, 1984). "The greening of the box office". Time. Retrieved March 28, 2016. ↑ Eliot 2013, p. 142. ↑ Appelo, Tim; Kilday, Greg (August 2, 1991). "Kathleen Turner: The last movie star". Entertainment Weekly. Retrieved March 28, 2016. 1 2 Turner 2008, unpaginated. ↑ Horowitz, Mark. "Back with a Future," American Film July/Aug. 1988. pp. 32–35. ↑ "Musical chairs in Hollywood." Time , September 24, 1984. Retrieved: March 28, 2016. ↑ Supplements for the Back to the Future DVD. ↑ Wilder, Joan (pseudonym) and Catherine Lanigan (ghostwriter). Romancing the Stone novelization." Amazon.com. Retrieved: March 28, 2016. ↑ Plumb, Ali. "14 things we learned from the 'Evening with Sylvester Stallone' Q&A." Empire Online, October 9, 2015. Retrieved: March 28, 2016. ↑ Susman, Gary. "'Romancing the Stone': 25 things you didn't know about the Kathleen Turner classic." movieforne.com, March 24, 2014. Retrieved: March 28, 2016. ↑ Leigh 2014, p. 171. ↑ "The Greatest Films of 1984". AMC Filmsite.org. Retrieved June 11, 2010. ↑ Nashawaty, Chris. "Was 1984 the Greatest Year in Movies Ever?". Entertainment Weekly. Retrieved June 11, 2010. ↑ "The Best Movies of 1984 by Rank". Films101.com. Retrieved May 21, 2010. ↑ "Most Popular Feature Films Released in 1984". Internet Movie Database. Retrieved June 11, 2010. ↑ "Romancing the Stone: Award Wins and Nominations". Internet Movie Database. Retrieved June 11, 2010. 1 2 "The 42nd Annual Golden Globe Awards (1985)". Golden Globe Award. Retrieved July 27, 2012. ↑ Eliot 2013, pp. 142–143. ↑ "Michael Douglas and Catherine Zeta-Jones to co-star in film 'Racing The Monsoon'." The Telegraph, May 19, 2008. Retrieved: March 28, 2016. ↑ Schaefer, Sandy"‘Romancing the Stone’ remake is still moving forward." Scree Rant, August 24, 2011. Retrieved: March 28, 2016. ↑ Fischer, Russ. "The 'Romancing the Stone' remake is now a TV series." Slashfilm.com, September 1, 2011. Retrieved: March 28, 2016. Eliot, Marc. Michael Douglas: A Biography. New York: Three Rivers Press, 2013. ISBN 978-0-3079-5237-0. Leigh, Mark. Epic Fail: The Ultimate Book of Blunders. London: Virgin Books, 2014. ISBN 978-0-7535-4126-5. Solomon, Aubrey. Twentieth Century-Fox: A Corporate and Financial History (The Scarecrow Filmmakers Series). Lanham, Maryland: Scarecrow Press, 1988. ISBN 978-0-8108-4244-1. Turner, Kathleen. Send Yourself Roses: Thoughts on My Life, Love, and Leading Roles. New York: Springboard Press, 2008. ISBN 978-0-4465-8112-7.